I had the good fortune to watch the 84th Annual Academy Awards with a group of good friends last night. It was a fun and exciting night of the film industry thoroughly lovin’ itself. (Complete list of winners is at the bottom.) But there are a few more awards that I think need to be mentioned. The award for Best Oscar Party Hostess goes to our friend K, who does such a great party every year, complete with swag bags, starfruit in the punch, golden-iced Oscar-shaped cookies, and a remarkably convincing statuette decorating the table. This year included a creative movie-related name contest for the potluck items – and her own Red Velvet Carpet Cupcakes were decorated with tiny edible silver stars. It was a classy shindig. The award for Best Potluck Dish Name went to Skye, for her work on Extremely Cold and Incredibly Delicious (homemade ice cream sandwich cookies). The award for Best Oscar Trivia Score went to… Me! This is the first year I did any preparation for my Oscar picks and the traditional trivia, and I can tell you, research pays off. Apparently the Trivia Master (Skye) and I visited some of the same websites – and I was able to remember 5 of the 7 men who have each won two Best Actor Oscars (if you’re curious, they are Spencer Tracy, Gary Cooper, Marlon Brando, Jack Nicholson, Fredric March, Dustin Hoffman, and Tom Hanks), and all 3 of the Best Pictures with the most awards at 11 (Ben-Hur, Titanic, and LOTR: ROTK). Plus, I’m good with movie theme songs, as it turns out. The award for Best Dress (and this is in my own estimation, with no knowledge of designers or fashion trends) goes to Penelope Cruz. Her dress was my hands-down favourite. 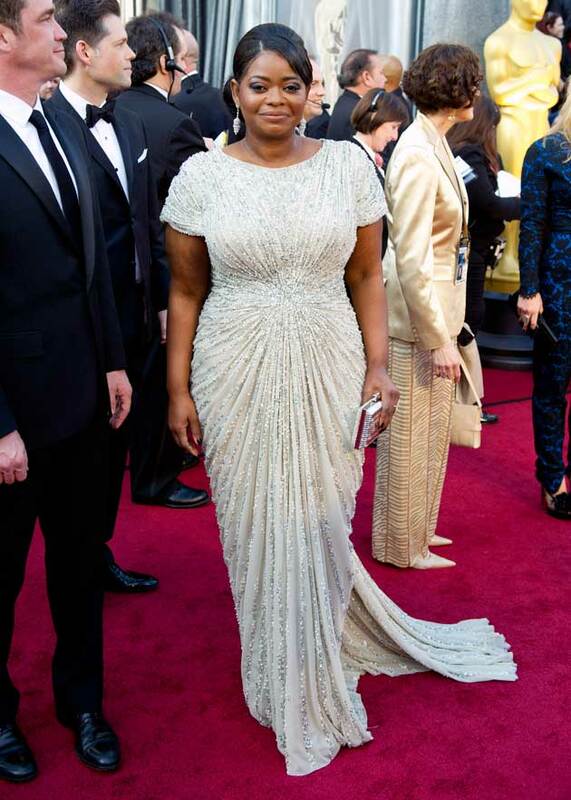 Other nominees for Best Dress would be Cameron Diaz, Glenn Close, Michelle Williams, and Octavia Spencer. The award for Best Ugly Dress (a.k.a. Worst Dress, but I know they don’t have Worst categories at the Oscars) goes to Meryl Streep, who, we all agreed, looked great from the neck up – but that dress just seemed like a Vegas-inspired potato sack. The award for Best Presenter Banter goes to Emma Stone, against straight man Ben Stiller. She was ostensibly star-struck and giddy and she totally pulled it off, in spite of being a humongous star herself by now. The award for Best Cute Accent in an Acceptance Speech has to go to Bret McKenzie of Flight of the Conchords (and his New Zealand accent), who won for his song Man or Muppet. He’s just adorable. Other nominees, though, would be the French guys – Jean Dujardin, Michel Hazanavicius, and Lucien Bource. I like me some French accents. The award for Best Foreign Language Presenting goes to Sandra Bullock. Did you know she spoke German Chinese? The award for Best Disarming Sincerity is tied between Meryl Streep and Octavia Spencer. Meryl said when they announced her name, she heard half of America groaning “Ugh – her! Again!” As if she isn’t incredibly deserving. And I’ve always wondered why more people don’t say “I’m freaking out!” in their speeches, like Octavia. The award for Best Sheer Star Power goes to George Clooney. He wrote, produced, and starred in The Ides of March – which was nominated for Best Adapted Screenplay – but also happened to get nominated for Best Actor in the Descendants… and still manages to look gorgeously easygoing and down-to-earth. That guy is OFF THE HOOK awesome. And my personal Big Raspberry Award goes to… I’m sorry… Billy Crystal. I think his hosting reign is over. His opening insert-himself-into-nominated-pictures montage was funny (you had to laugh at the kiss between him and George Clooney), but his old people jokes, French people jokes, black people jokes… they just weren’t funny. Even the Jewish jokes were iffy. And he’s forgotten the art of deadpan. I winced a few too many times for enjoyment. I agree, K does a great job of hosting the Oscar party! I love my necklace (and so did the kids at school) and my swag bag. I feel like a real celebrity (okay, maybe not ‘real’, but as close as I will ever get!). Awww, that Oscar party sounds perfect! Skye, I know you are famous for your desserts but that one sounds like maybe the best ever. Our Oscar party was mostly from cans! Chili, black beans and corn, with some nice pan-fried squash (not canned). The fancy part was the genuine southern (canned cherry) cobbler! Yay Academy cobbler! I saw an inordinate amount of Red Carpet shenaniganning, both before and after, on whatever network that was – CBS? NBC? Some American thing. Anyway, the funny thing was that there were several dresses that got both praised and panned, depending on who was talking (and I think actually one guy did both to one!). Rooney Mara, Melissa McCarthy and Angelina Jolie come to mind. Everyone LOVED Michele Williams… but here I’m going to make myself totally unpopular and say that I don’t get it with her. I know I’m supposed to think she looks amazing but I always think she looks a little…weird! If questioned in public, I would feel compelled to say, oh yes, mmhmm, amazing, red dress, perfect, dazzling. But I don’t actually feel it. HOWEVER I am totally with you on Penelope Cruz. THAT is the princess dress that dreams are made of. And I think she is gorgeous like nobody’s business. And everyone was like, Meryl Streep, ooh, so regal! Cause she’s Meryl Streep and they couldn’t say anything bad. But I thought she looked like she was a package wrapped in that metallic paper that doesn’t stay folded very well. Didn’t matter though. She was awesome. One guy loved Cameron Diaz’ dress but said she needed a new stylist, the hair ruined it for him. Did you see George Clooney before the show? He was all like, I’m so cool, I don’t even need the fact that I was Batman. I think he must be made of some weird hypnotic impenetrable element or something. It’s like he owns the Oscars, and maybe all of Hollywood or something, he’s so on top of it all. I think the supermodel on his arm was a bit much though – he can’t be Truly Perfect as long as he’s dating photoshopped women with nothing to say. Danny and Tess works much better. Also I agree with you COMPLETELY about Billy Crystal. There were a few moments where it would have been funny except then he said something and ruined it. And, I’m sorry, but he looked like he’d been embalmed by his makeup artist. He looked like a ventriloquist’s dummy. Even Ben Stiller is sporting grey temples (though were they real or another costume?) and Billy is wearing shoe polish on his head. Oy vey. Though I actually thought Hugh Jackman was a bit awkward when he did it. I like him but he doesn’t get my vote. It is quite obvious and inevitable who should host the Oscars next year. JAMES MCAVOY. Duh. And Bret McKenzie? We felt the same about Cameron’s hair – there were comments that we could have had that done at First Choice. Also Gwyneth Paltrow’s boring ponytail. Did you know Stacy Keibler (George Clooney’s GF) used to be a pro wrestler? EMBALMED! SHOE POLISH! LOL. So true. And I’m so, SO down with the James/Bret idea!!!!!! PLUS she’s the hot bartender in HIMYM, the one who asks Barney to choose between her and his suits. She’s important! 1) Whatever that Fantastic Flying Books thing is, I’d like to see it! 2> Glenn Close – fab dress. Michelle’s dress – I’D wear it! 3}Cherry cobbler – did you bring some home with you? i wish you could’ve been there too, Berty! it was actually mostly me with the partying. Pops was not so much into it, and Wina did her best but has limitations. I like Glenn’s dress too. Question: why are there not more girl babies named Glenn? I mean, you would think it would be one of those names like Chase or Devon that girls get named even though it sounds like a boy, because that is totally a thing. And I want to see that movie. Did you know that she played the same part on Broadway a long time ago? No cobbler. But I’ll make you one anytime, honey! Though prob not with Bisquick, as this one was made with. Your comment makes ME so happy! Thanks, Mo!